There comes a time in every home owner’s life when you run out of space. Maybe you started a family and there aren’t enough rooms for the kids. Maybe you took in your aging parents and the guest space is starting to feel a little cramped. Whatever the case, you’re trying to decide an age-old question: should we move or renovate? On one hand, you love the neighborhood and the school district. You’d miss all the memories you’ve made here. On the other hand, you desperately need more room—so, what do you do? Choosing to move or renovate really depends on your unique situation. You have to consider your budget, what your family wants, and the housing market overall. Here are the pros and cons of moving versus renovating your existing home. You don’t have to battle a construction zone. One major advantage of moving? You don’t have to live in a construction zone for several months. Renovating your home, especially if it’s a larger project, can drive some people batty. Contractors typically start their workdays early—and it often includes the use of power tools. You don’t have to seek out a contractor. If you’re thinking about a remodel, you’ll want to find a reliable contractor. Don’t know how? Start here to learn how to find a good contractor near Loveland. If you choose to move, you can avoid the headache of finding a good contractor that meets your budget and your time frame. You can change locations. If you’ve ever dreamed of living in a new city or suburb, now is the time. 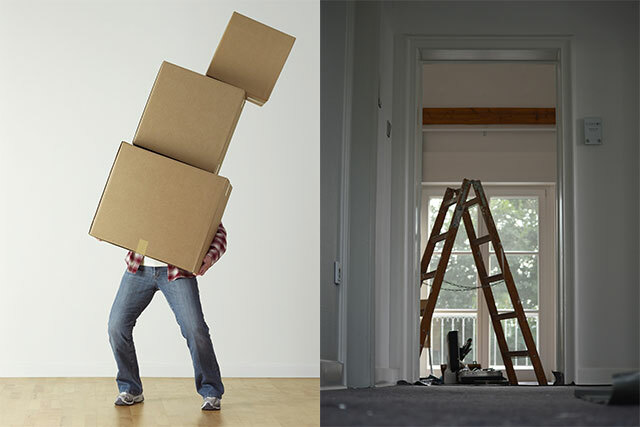 Moving can help you start fresh. You might not get exactly what you want. When you move, you might like almost everything about your new home, but you likely won’t find everything you crave. Renovating, on the other hand, lets you customize your home to your specifications. You’ll have to go through the selling process. Selling your home can be a pain, too. You must find a realtor, go through the showing process, and then finalize everything. The process could take months—and it can be exhausting. You can renovate exactly the way you want. Like we said before, renovating lets you customize your home to your specifications. Have you always wanted new hardwood floors? Done. Need to add a master bath to the guest room? Can do. You can stay in your neighborhood. If you love your neighbors and your school district, renovating gives you the luxury of being able to stay put. If you feel grounded here, don’t leave—consider renovation instead. You can avoid the hassle of moving. Another beautiful pro of renovating? You can avoid having to schedule movers, pack all of your belongings, and disorganize your entire life. You might not get your money back. When renovating, a common worry for any homeowner is “will this renovation add value to my home”? If you’re hoping to sell in the future, there’s no guarantee you will get your money back—but it’s likely, if you make the right renovations, that you’ll see your home’s value increase. You’ll have to deal with construction. Construction noise can be a nuisance, but it won’t last forever. However, we’ll still count this as a con since you may have to schedule your sleep around your contractor’s work hours. You’ll still face some expenses. Like moving, renovation can be expensive. Thankfully, with a renovation, you can pick and choose what you want to add on or renovate. Compared to moving, you may find that renovation is the more cost-effective option…however, in some cases, it can be more expensive. It varies by situation. While there are no hard and fast rules on what to do next, considering your 10-year plan is a great start when making your decision. Ask yourself where you want to be—if you still see yourself in your home and you never want to leave, renovate. If you’re hoping to travel the world, maybe a move isn’t a bad idea. At H3 Construction and Design, our team is always happy to walk you through considerations for any home improvement project. Tough questions are our speciality—and we can sit down with you and provide consultation for any home renovation project you are considering.